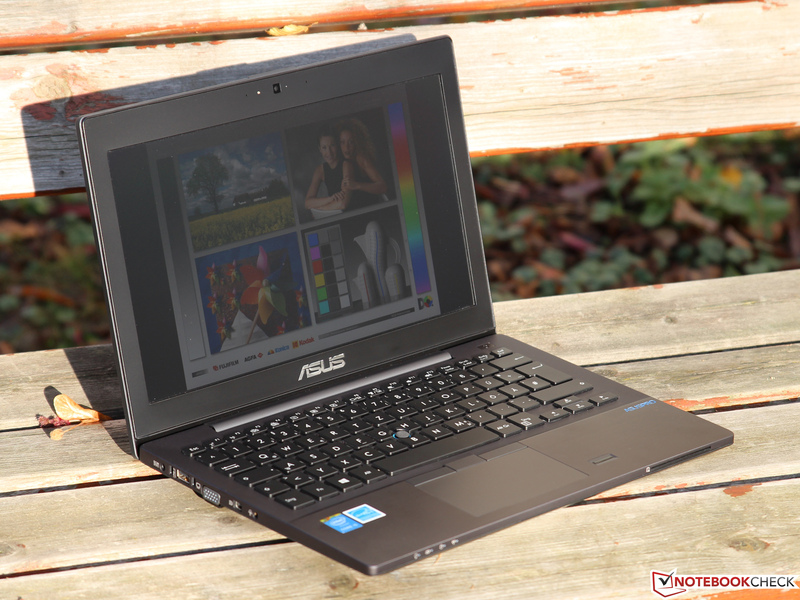 Asus might not be the first manufacturer you would think of when you want to buy a high-quality business notebook. 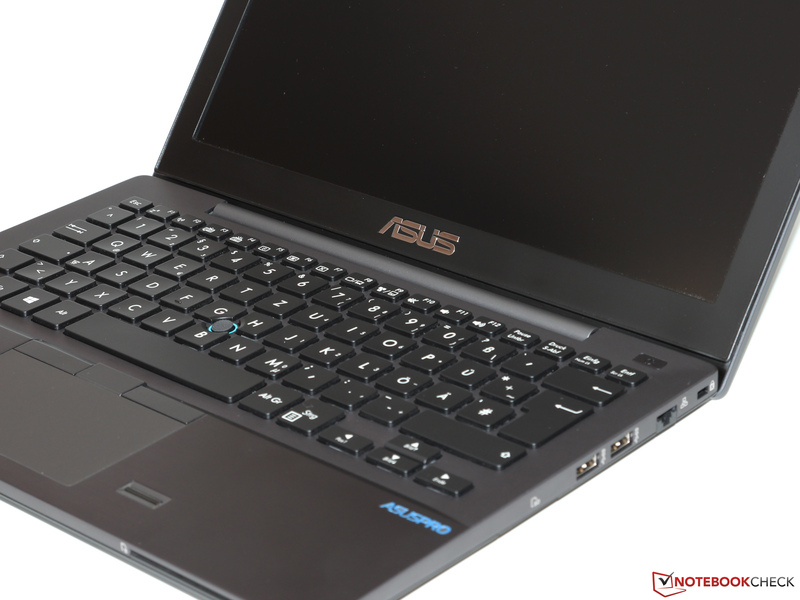 But the Taiwanese manufacturer actually has an impressive lineup of these notebooks in its ASUSPRO-series, which have impressed us in the past. 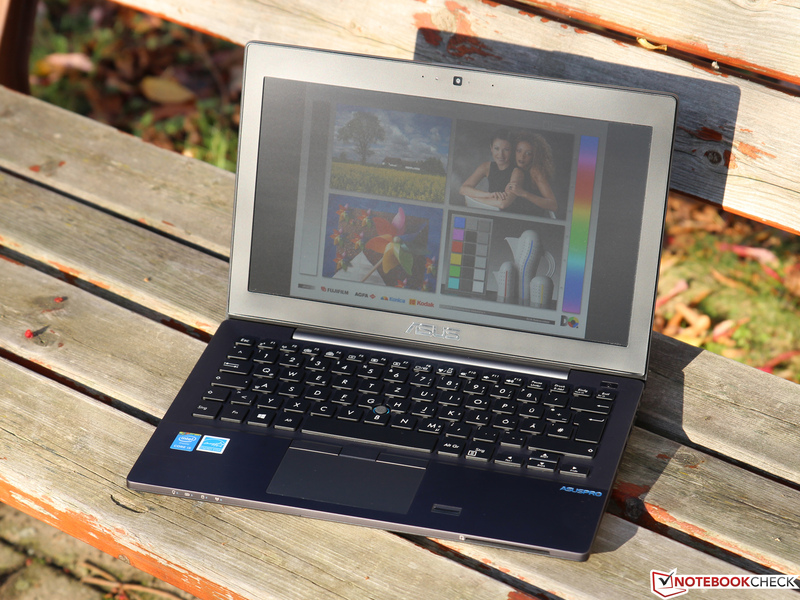 The latest member of the family is the AsusPro Advanced BU201LA, a 12-inch subnotebook with a price of around 800 Euros (~$985). 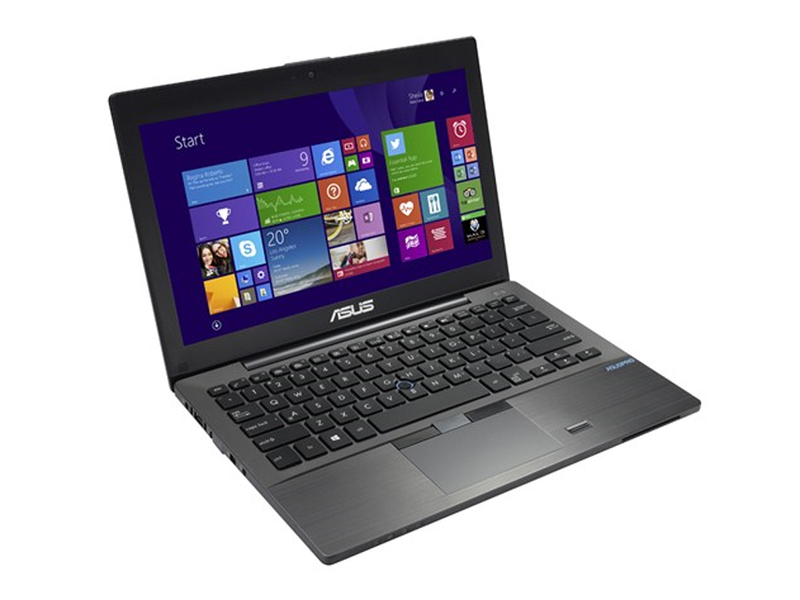 For this price you get a Haswell Core i5-4210U, 4 GB memory, as well as a 500 GB hard drive. The matte IPS display has a high resolution of 1920x1080 pixels, which is a real surprise in this price range. As it is typical for business devices, the user can choose between the two operating systems of Windows 7 Professional and Windows 8.1 Pro; the older version was preinstalled on our review unit. 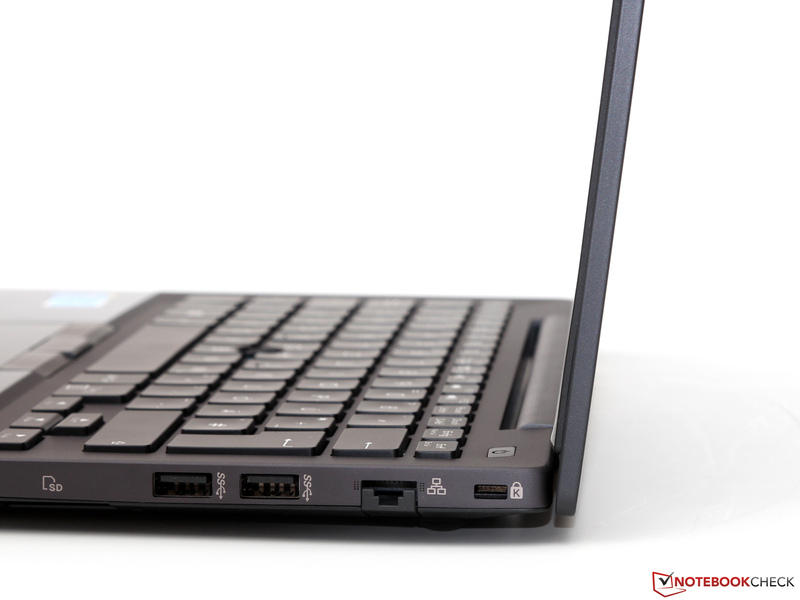 Even though the BU201LA is a rival for Lenovo, Dell and HP, we are not able to find really comparable configurations. A similarly priced ThinkPad X240 is less well equipped, and the Latitude E7240 or EliteBook 820 G1 are not even available for under 1,000 Euros (~$1230). 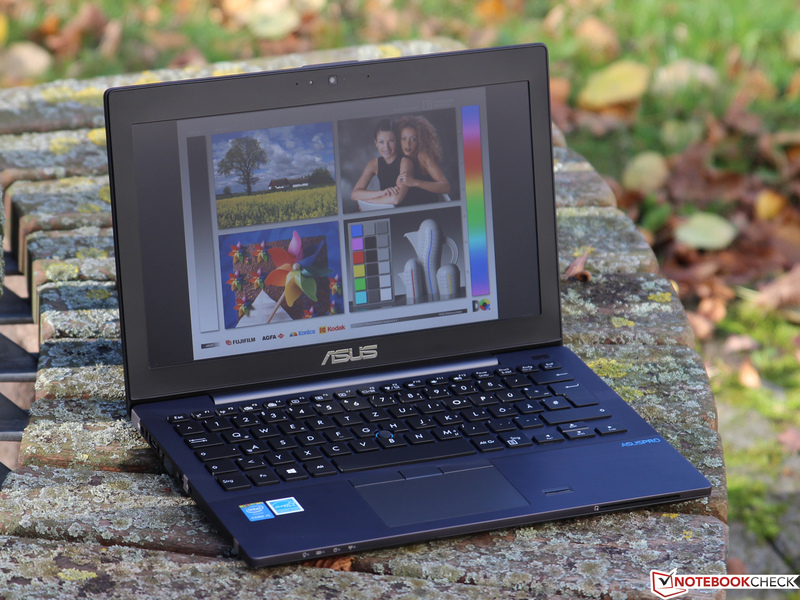 The price is therefore one argument for Asus – but is this also true of the quality? 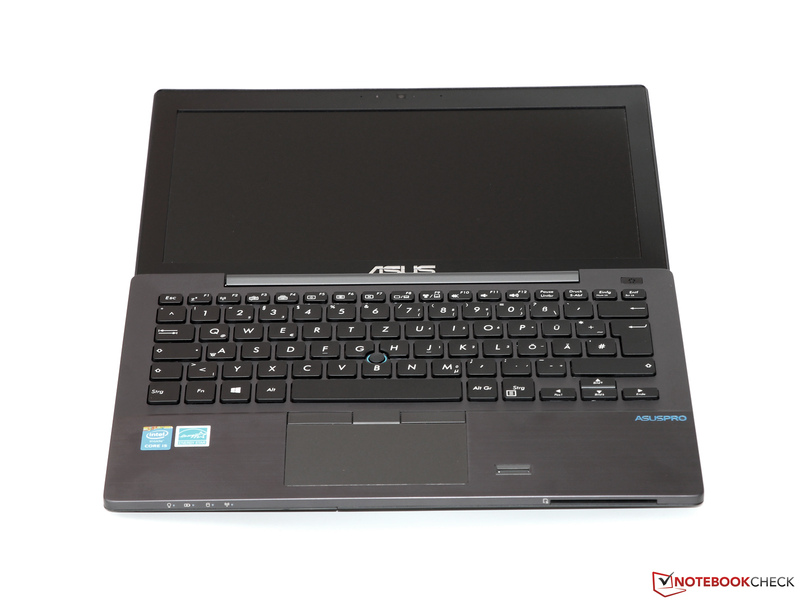 The AsusPro BU201 forgoes unnecessary design elements, and is a simple and restrained working device. The chassis in a subtle dark gray is mainly made of plastic, but both the design as well as the haptics, leave a very sophisticated impression. 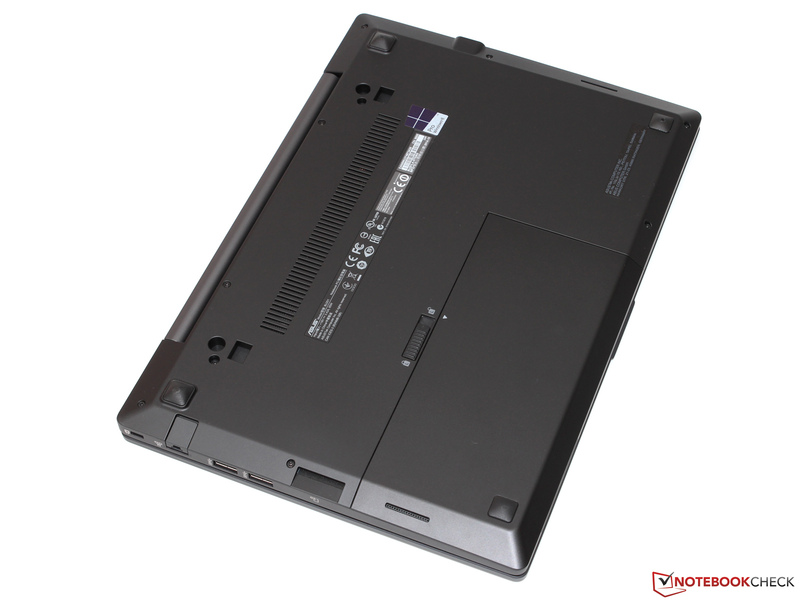 With a weight of 1.36 kilograms (~3 lb), and a height of less than 21 millimeters (~0.83 inches), the notebook can carry the popular Ultrabook title, and is therefore primarily designed for traveling business customers and field staff, where mobility is a very important aspect. 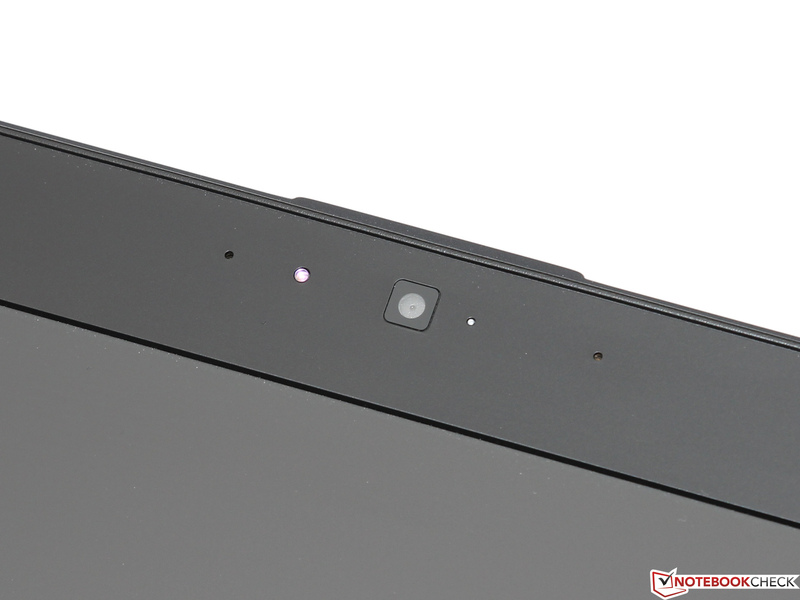 Despite the pretty slim construction, the chassis is impressive with its excellent stability. 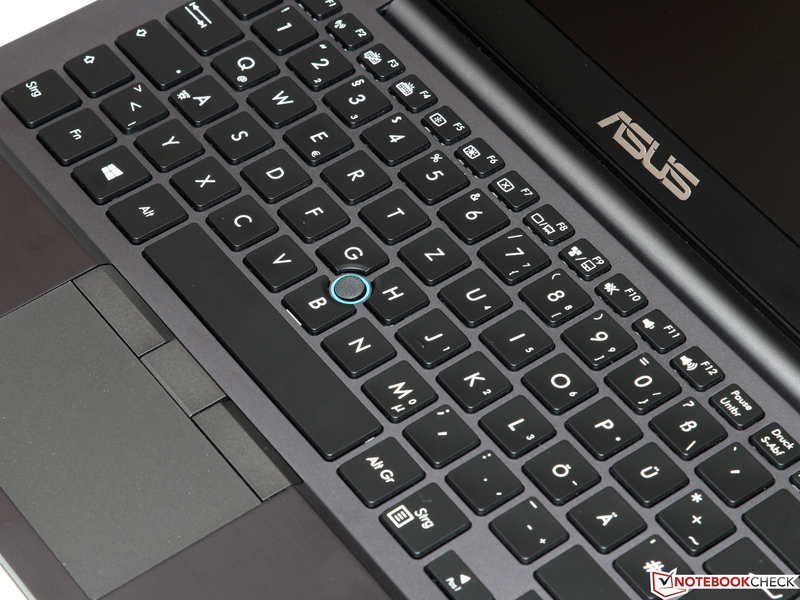 Concentrated pressure is no challenge for the case, not even in the usually problematic areas around the keyboard – no surprise since Asus promises that the BU201 was tested according to the strict U.S. military standards (MIL-STD 810G). Unfortunately, the impressive performance of the base unit does not extend to the display: Even though the construction was reinforced with carbon fiber, you can easily twist the cover with little force and hear quiet creaking sounds. We liked the precise hinges much better, they reduce bouncing to a minimum, but you can still open the lid with one hand. In terms of build quality, our review unit does not have to hide behind the usually more expensive competition, nor does it reveal any noteworthy drawbacks, even at a closer inspection. Small gaps and carefully rounded edges confirm a good quality control, which is, however, expected in this product class. 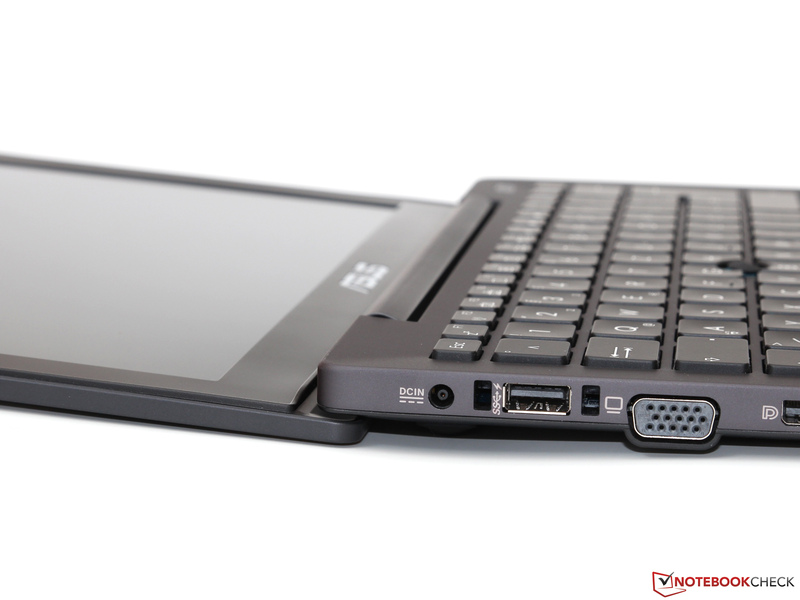 Regardless of the mobile focus, the notebook offers a convenient choice of the most important ports that are necessary for a real working device. As well as three USB 3.0 ports, it also includes two video ports to attach older projectors (VGA-out) and modern Ultra HD displays (Mini-DisplayPort). However, users should note that Intel's current ultrabook CPUs only support the maximum resolution of 3840x2160 pixels with 30 fps. 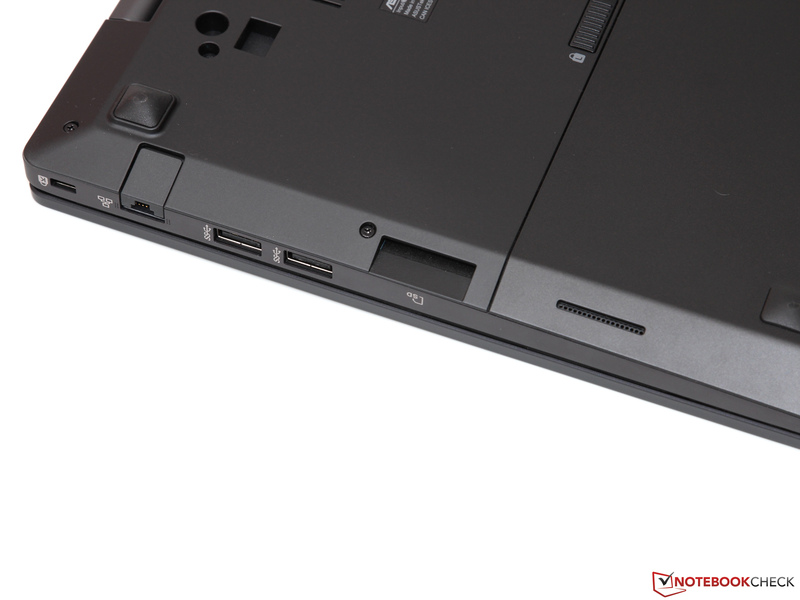 All ports are located at the rear of the sides and are, except for the SD card reader – which requires the lifting of the device – pretty easy to reach. The optional docking station is a good choice for stationary use. Asus' own "AsusPro Ultra Docking Station" is attached at the side of the notebook, and includes among others, additional USB, Ethernet and display ports, at a cost of 200 Euros (~$246) extra. Even though our review unit does not support the latest WLAN standard 802.11ac, we cannot criticize the performance of the integrated Intel Wireless-N 7260. At a distance of around 3 meters (~10 ft) from a TP-Link Archer C7 router, we managed the impressive transfer rates of up to 23 MB/s, which corresponds to 184 of the theoretically 300 Mbps possible. An excellent result for a dual-stream adaptor in an 802.11n network, especially since both the range and the signal quality were above-average. Other advantages are the dual-band support (2.4 and 5 GHz) as well as Bluetooth 4.0. Integrated LTE and GPS modules are only available as options (and not in every country). As usual, the picture quality of the webcam was almost disappointing, which can only be used for simple video chats with its 0.9 MP. Colors, details and picture noise cannot be compared with the much higher level of smartphones. Users at least get a fairly good array microphone, so you basically do not need an additional headset. 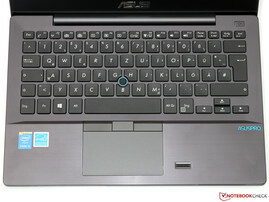 With features like Kensington Lock, SmartCard slot, fingerprint reader and TPM chip, the BU201 actually has quite a comprehensive security package; only Intel's Anti-Theft and Computrace are not mentioned by the manufacturer, and we suspect they will only be available in the larger sibling BU401. Central administrative tasks like software updates or the creation and import of backups are easily done in the AsusPro Business Center. In addition to the matching power adaptor, the scope of delivery includes various drivers and Windows DVDs, to simplify the subsequent (new) installation of Windows 7 or Windows 8.1, respectively. Other additions are a few software tools, including, for example, a background service to protect the hard drive against shocks,. 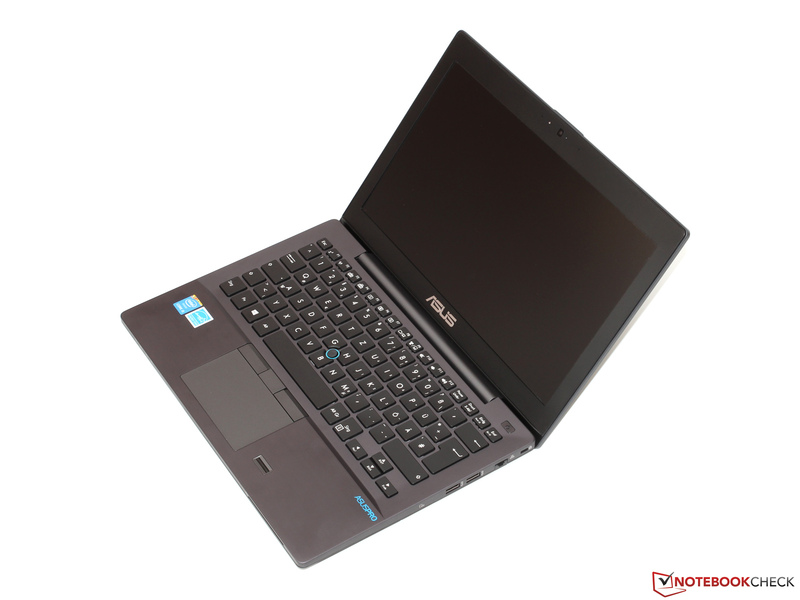 Fortunately, Asus has waived unnecessary trial and advertisement applications completely. We could not find a maintenance hatch in the BU201 – you will have to dismantle the whole case if you want to access the internal hardware. However, it was not easy to open our review unit even after we loosened all the screws; the cover might have been slightly tight, or there might have been more screws underneath the support feet, but we did not want to damage our test sample. Anyway, the upgradeability should be limited to an additional memory module (4 GB soldered, one empty DIMM slot) or the replacement of the WLAN module and hard drive (2.5-inch; 7 mm). While other manufacturers like HP or Lenovo offer a long warranty period of 3 years for their professional devices, Asus only offers a two-year Pick-up & Return service. An extension to a total of 36 months is available for around 140 Euros (~$172), and also includes an on-site service on the next business day. 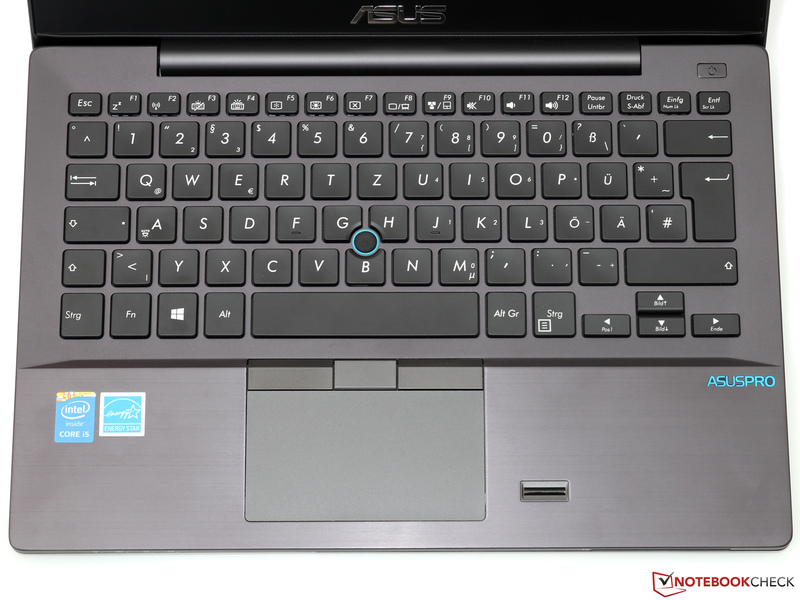 The quality of the input devices is one of the most important features for many users – for a business notebook in particular. This is why we were eager to see if the BU201 is able to compete with the established rivals in this section. The answer is a clear Yes. The spill water-resistant keyboard is not only impressive with its above-average key stroke, but also with the firm and almost perfectly adjusted pressure point that reminds us of the current ThinkPads. The rich, mechanical clattering of the 15 x 15 millimeters (~0.6 x 0.6 inches) keys adds the quality sound effects. 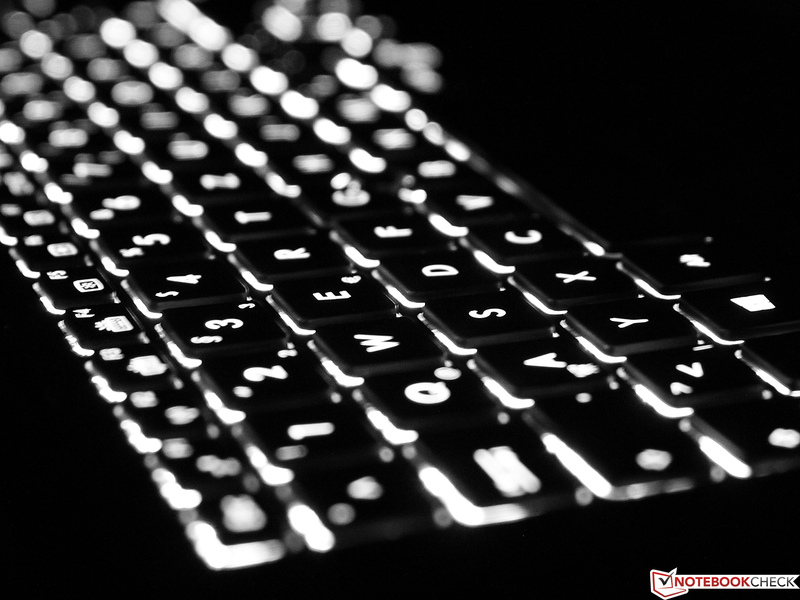 Because of the excellent feedback, there is no problem to type long texts accurately, and thanks to the three-stage background illumination even in darker environments. 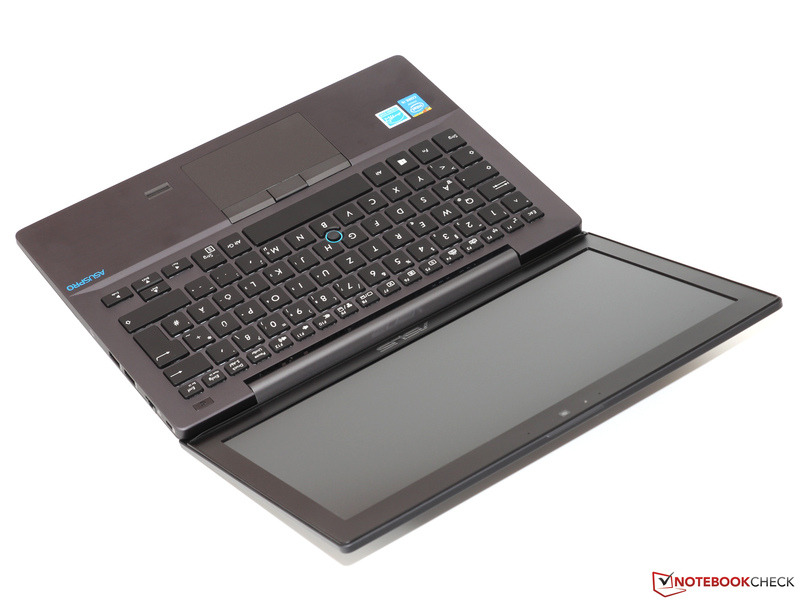 With its size of 9.5 x 5.3 centimeters (~3.7 x 2.1 inches), the touchpad from the manufacturer Elan provides sufficient space for several multi-touch gestures with up to three fingers. 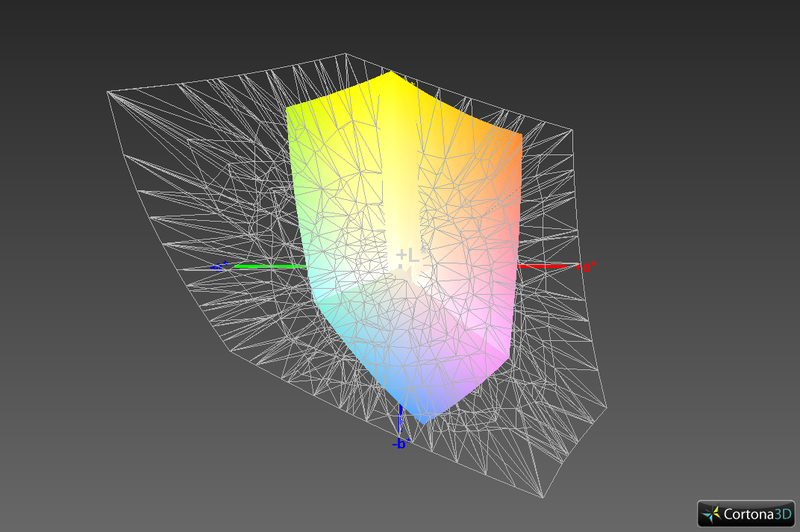 The smooth surface basically provides good gliding capabilities, but sweaty hands can sometimes cause stick-slip effects that can be annoying. 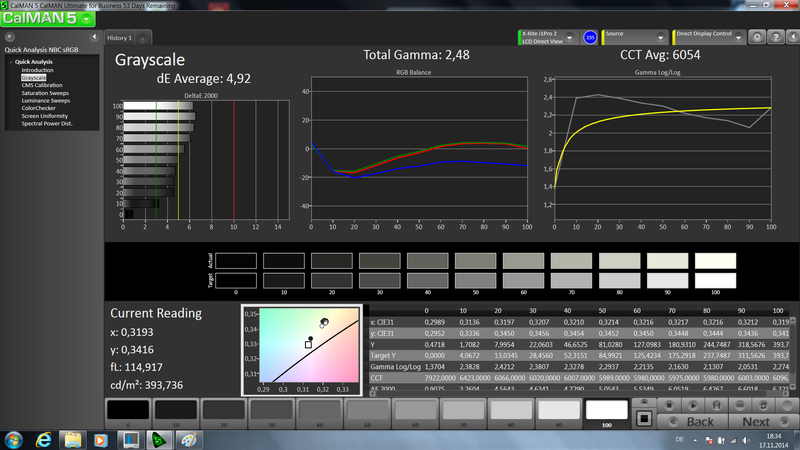 The additional trackpoint (also called SensePoint by Asus) does not have these problems. Both mouse replacements are similarly precise and reliable, so the user can choose their preferred input method. 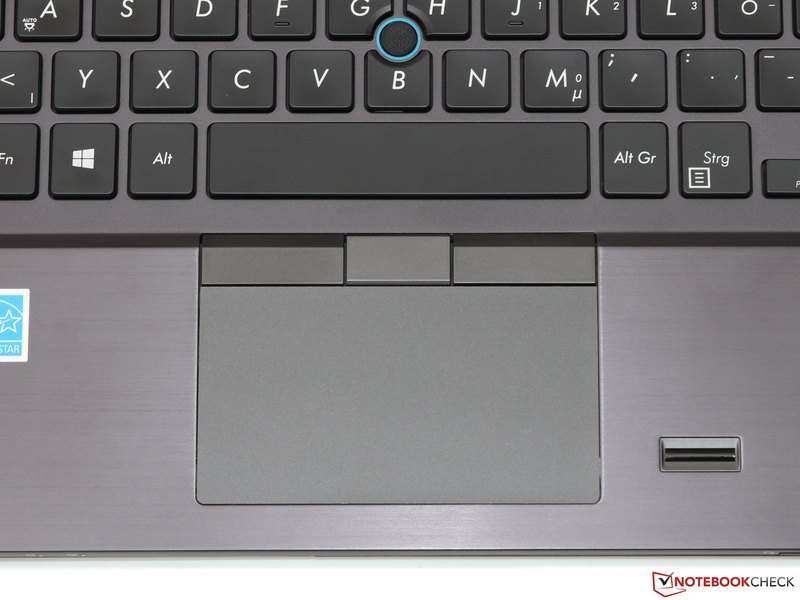 The touchpad does not have dedicated buttons, instead, clicks are executed by pressure on the left or right side of the surface – the clicks have a limited travel and a firm pressure point. 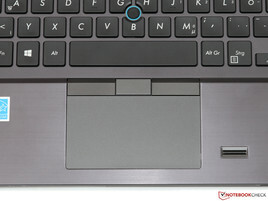 Smoother, but not less precise, are the three buttons of the trackpoint; the middle button acts as a scrolling bar. 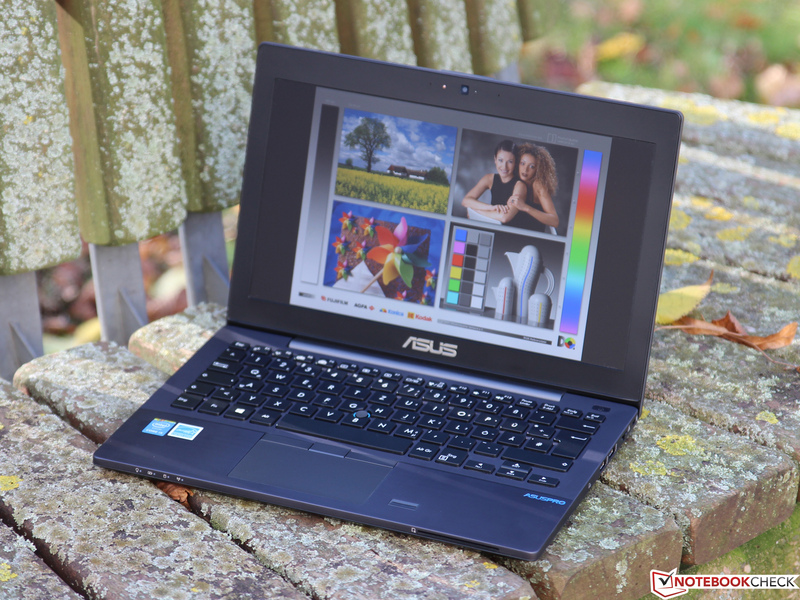 A Full HD display based on the IPS technology as a standard option – Asus deserves high praise even before we look at the exact measurements. While other manufacturers only equip their devices with WXGA displays and a meager pixel density of 125 ppi in the standard configurations, the BU201 can score with 1920x1080 pixels and very sharp 176 ppi. It does not matter if you browse the web, use Excel or just multi-task: The additional space on the desktop is a huge advantage for productivity. However, the pixel density is not too high, so there are no problems with scaling issues of older applications – the result is a good compromise. The powerful background illumination is convenient as well. If necessary, the LED backlight reaches an impressive brightness of up to 396 cd/m², which means it easily beats the EliteBook 820 G1 (WXGA TN panel, 211 cd/m²), Latitude E7240 (WXGA TN panel, 211 cd/m²) and ThinkPad X240 (WXGA IPS panel, 340 cd/m²). However, we have to mention that the optional premium displays from Dell, HP and Lenovo are on a similar level, between 350 and 400 cd/m². The somewhat uneven brightness distribution of our review unit is not visible with the human eye. We already know the IPS panel, which is provided by the manufacturer LG (designation LP125WF2-SPB2), from the formerly mentioned ThinkPad X240, where it impressed us with a vivid and high-contrast presentation. Our AsusPro BU201LA can even exceed the results of the old review, and manages an excellent contrast ratio of 921:1 (X240: 728:1). Because of the good black value, the subjective picture impression is superior to the majority of TN panels. The display calibration is just average ex-works, and we can sometimes see clear deviations for the colors (DeltaE: 5.6) and the grayscale (DeltaE: 4.9). 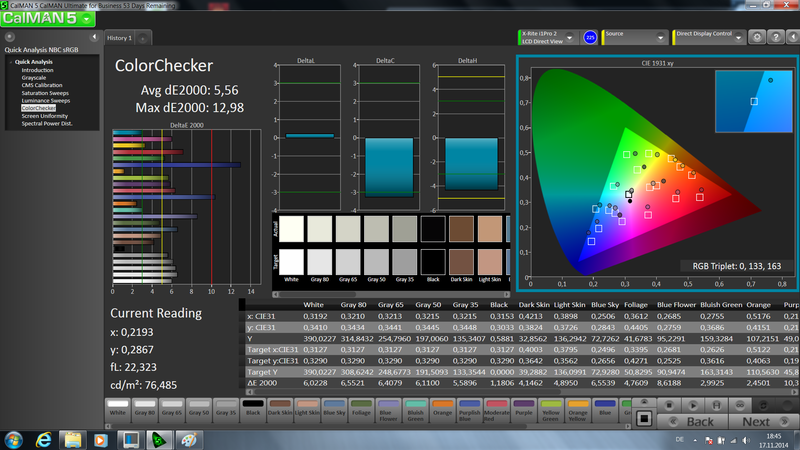 While the grayscale performance can be improved significantly with an optimized ICC profile, there are no real improvements for the colors. 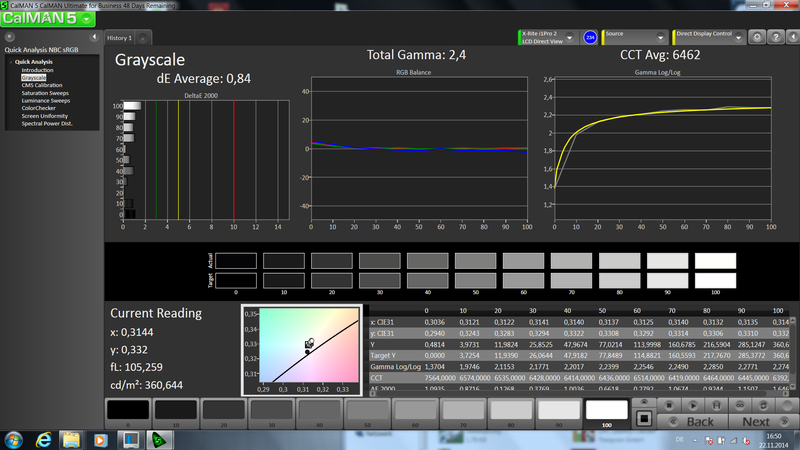 Maybe the limited color space prevents a better result since it only covers 56% sRGB and 41% AdobeRGB. This is a rather serious issue for professional picture editing, but should not be a problem for other users. 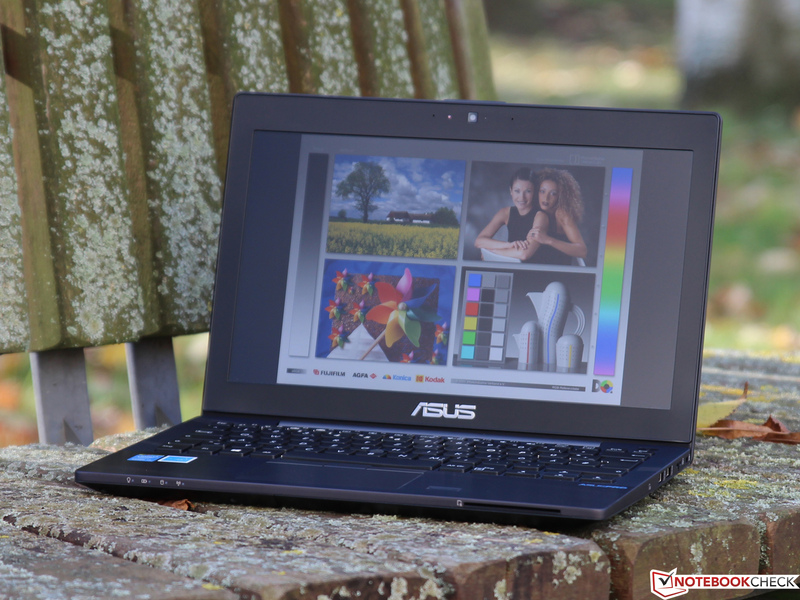 As a compact subnotebook, the BU201 is perfectly suited for use in the outdoors. Thanks to the bright and anti-reflective display, this is not a problem at all, even under bright sunlight. 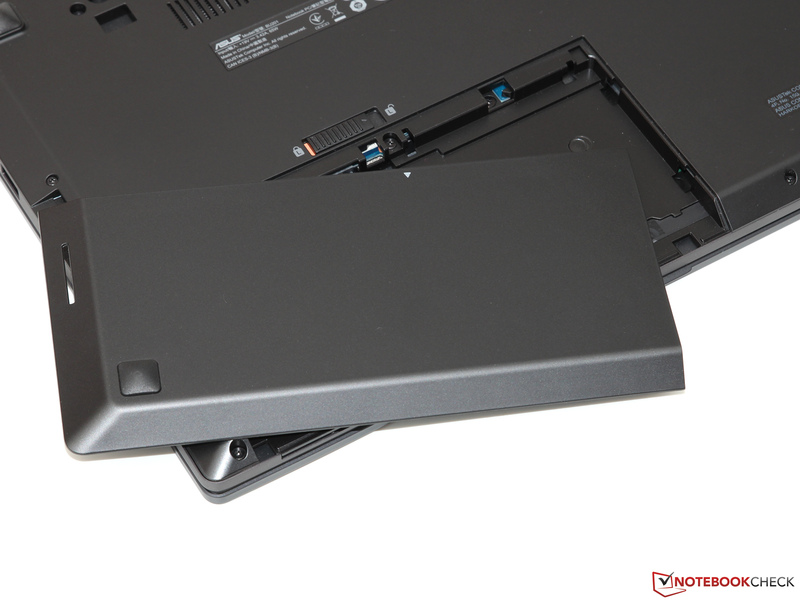 The darker panel of the HP EliteBook 820 G1 as well as the glossy touch panel of the Dell Latitude E7240 have problems with visibility in the outdoors, only Lenovo's ThinkPad X240 can keep up with Asus' ultrabook. As always, we finish the display section with the evaluation of the viewing angle stability. 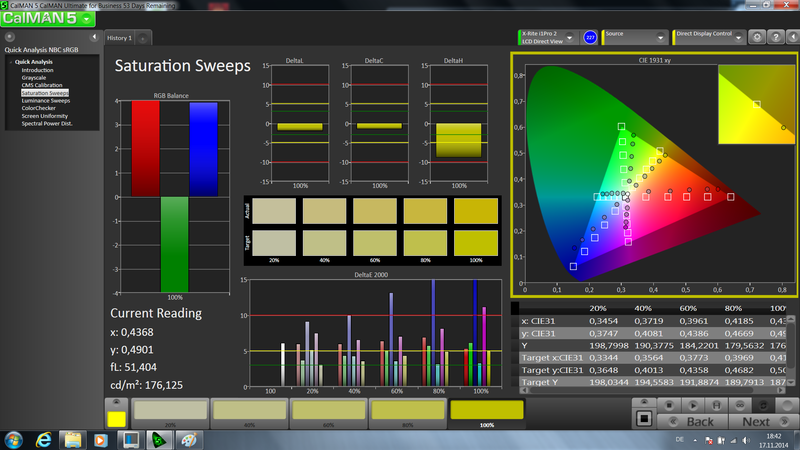 The IPS panel of our review unit once again achieves excellent scores. Colors and the contrast can be maintained for a long time, only very extreme angles will result in a small drop of the picture quality. This means that several people can look at the display of the BU201 at the same time without any problems, which would not be possible with a cheaper TN panel. 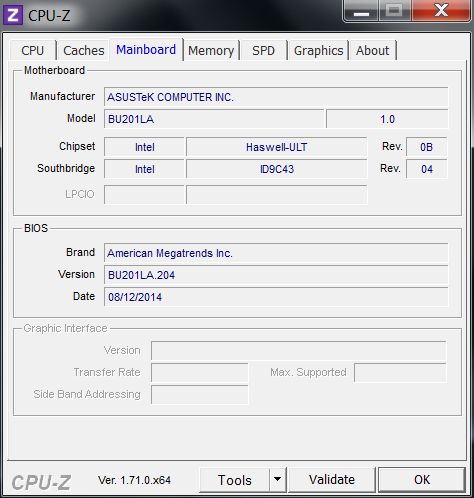 Since Intel's new 14 nm generation Broadwell is currently only available as an extremely frugal – and therefore not that powerful – Core M, Asus still uses a CPU with the proven Haswell architecture. 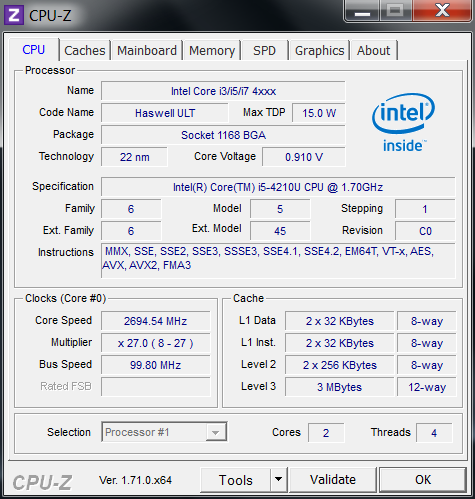 The Core i5-4210U replaces the popular Core i5-4200U and has a slightly higher clock of 1.7 up to 2.7 GHz (2 cores: 2.4 GHz). 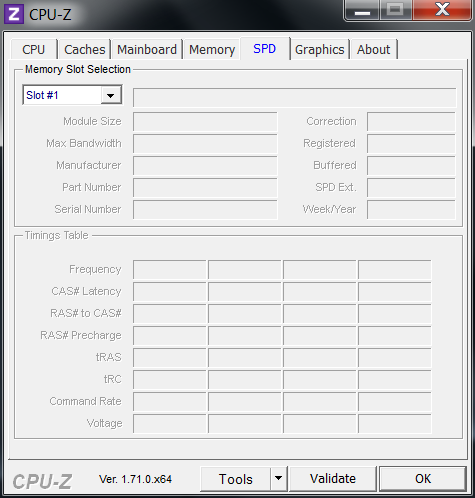 Besides the Turbo Boost, the 15 Watts model also supports Hyperthreading as well as several other features that can be looked up in our database. 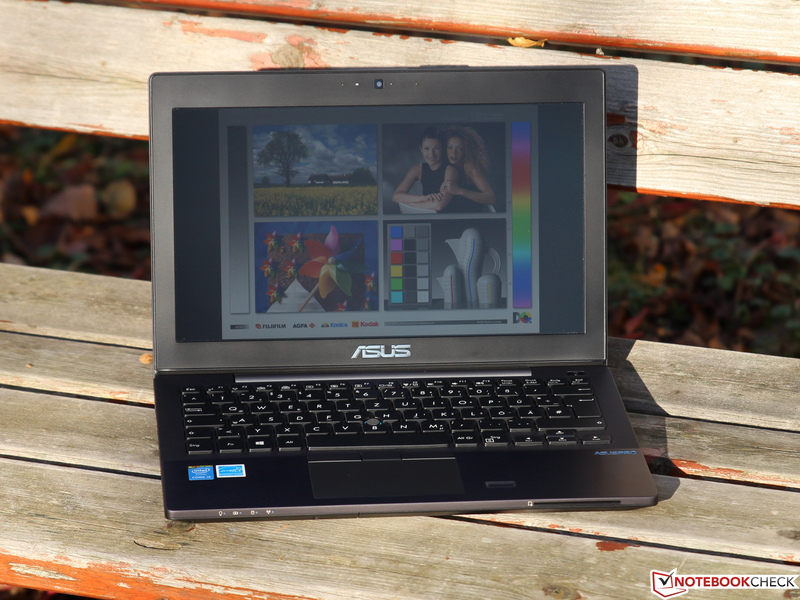 The BU201 is a business notebook, and therefore waives a dedicated graphics card. Instead, it uses the integrated HD Graphics 4400, which is already 1.5 years old and with its 20 Execution Units (EUs) and a clock between 200 and 1,000 MHz does not promise the highest 3D performance, but on the other hand, it scores with its efficiency and multimedia features. With 4 GB DDR3-1600 memory and a 500 GB hard drive, the only available configuration in Germany is not really generously equipped, but that is a result of the low retail price. We have already mentioned the upgradeability in the Maintenance section. 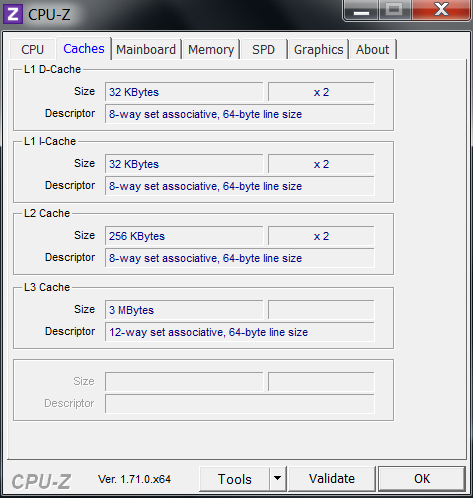 ...2.4 GHz in multi-thread scenarios. The Turbo Boost potential of the Core i5-4210U is almost completely utilized on mains power, so the benchmark results are accordingly high. With 2.59 points in Cinebench R11.5, the BU201LA does not have to hide behind the ThinkPad X240 or the EliteBook 820 G1, where the Core i7-4600U is only 3 to 9% faster. 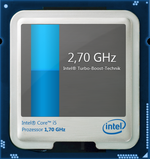 The reason is quickly found – the Core i7 is specified with a TDP of 15 Watts as well, so the higher clock is only an advantage in short tests or single-thread benchmarks. In our opinion,the high-end CPU cannot justify its substantial additional price. 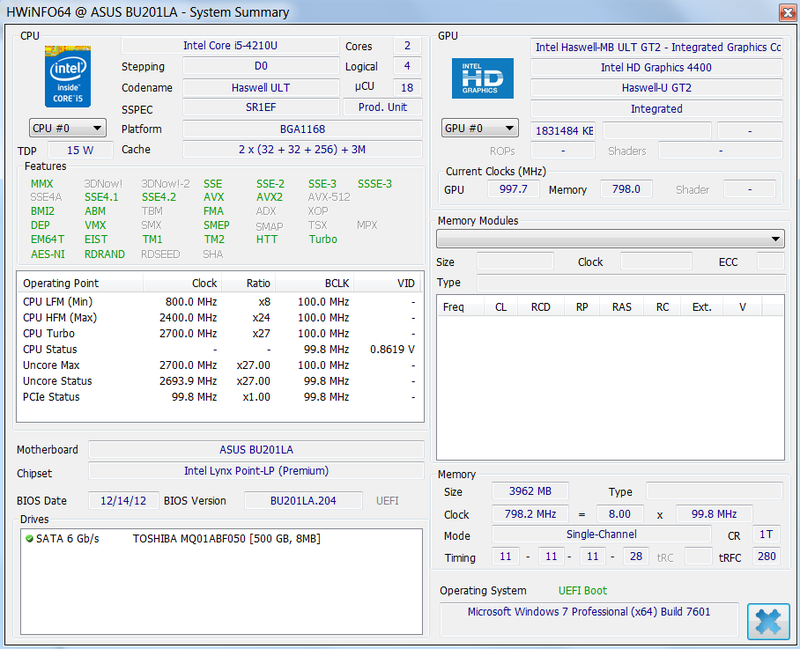 Unfortunately, Asus limits the performance on battery power, even though the performance disadvantage is not that big. 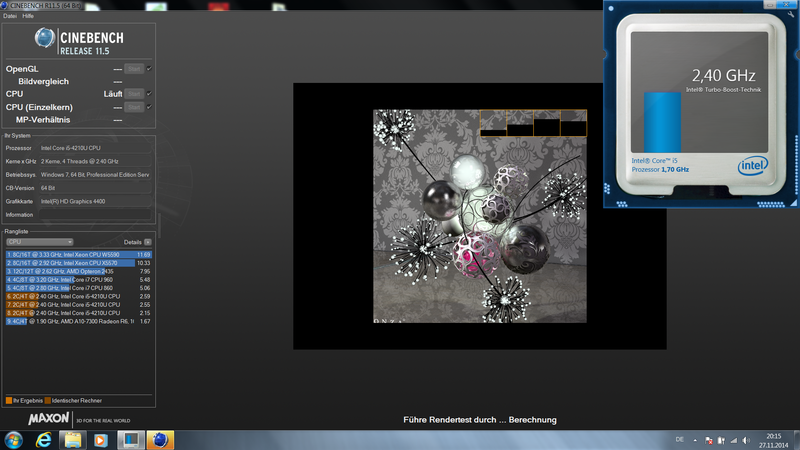 The Cinebench R11.5 score, for example, drops to 2.15 (multi-thread) and 1.14 points (single-thread), respectively, a difference of 3 and 17%. 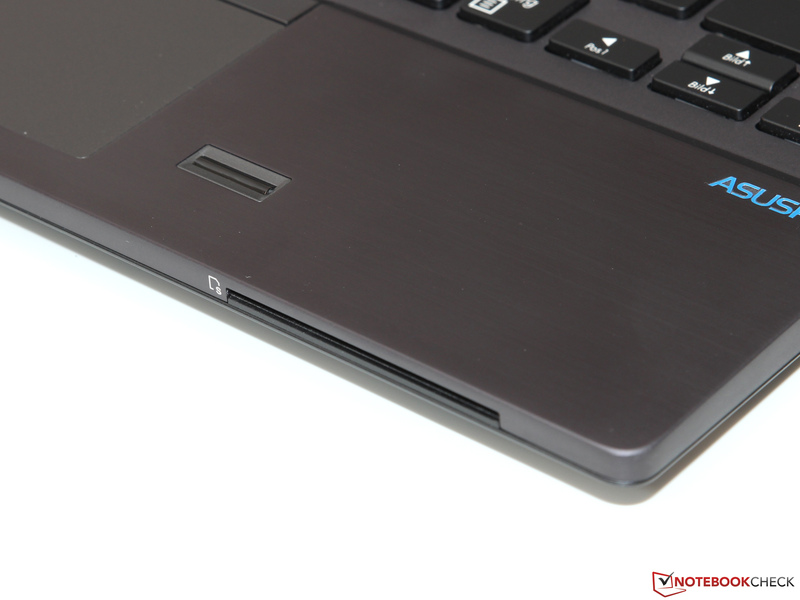 No SSD or SSHD (hybrid drive with a small flash storage cache), but a conventional 500 GB hard drive from Toshiba is the storage solution of the subnotebook. The rather generous capacity comes with a mediocre performance that is common in drives with a similar speed (5,400 rpm). 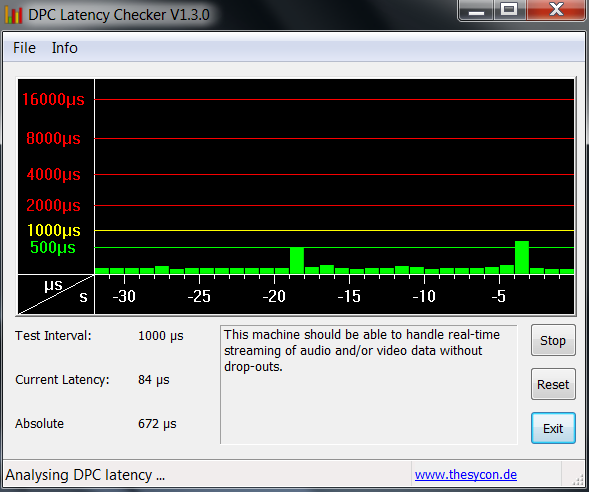 This means sequential transfer speeds of around 83 MB/s and an access time of 17.7 milliseconds. 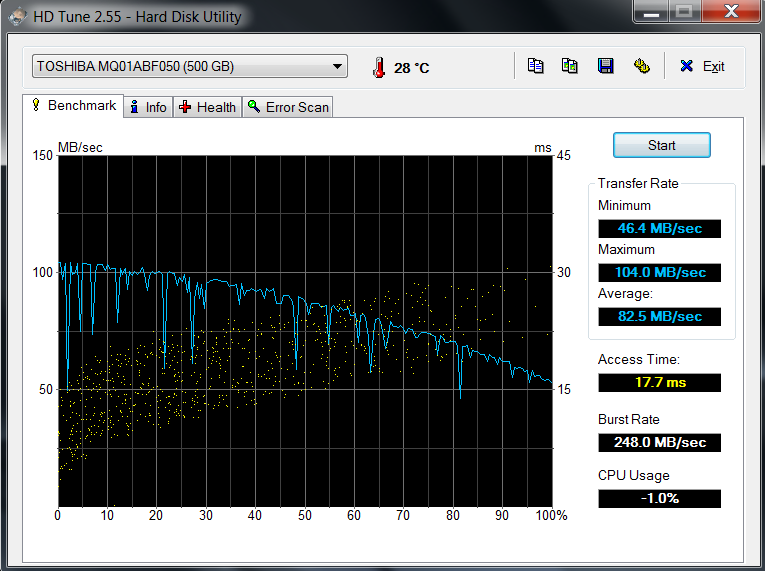 A smaller, but much faster 128 GB SSD would have probably been a better (and hardly more expensive) choice. 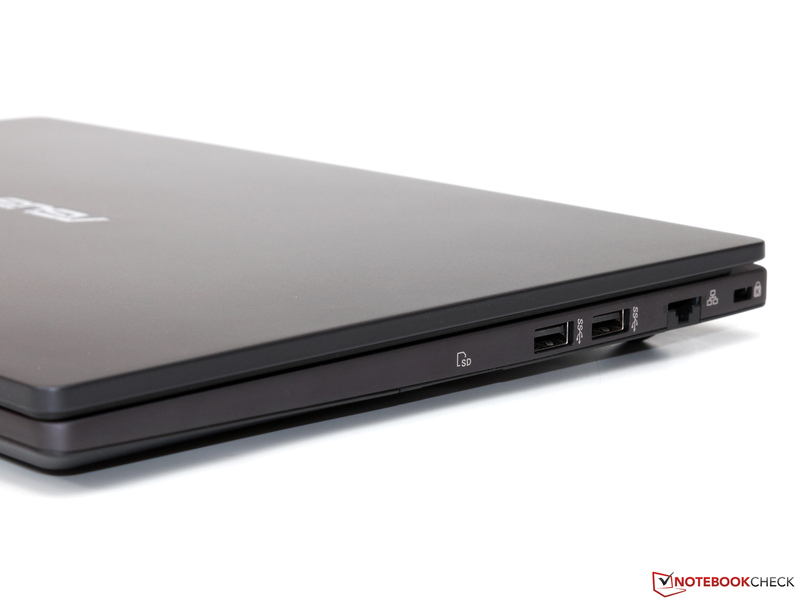 Due to the lack of SSD, the BU201LA lags behind all the rivals in the very storage-focused PCMark 7. 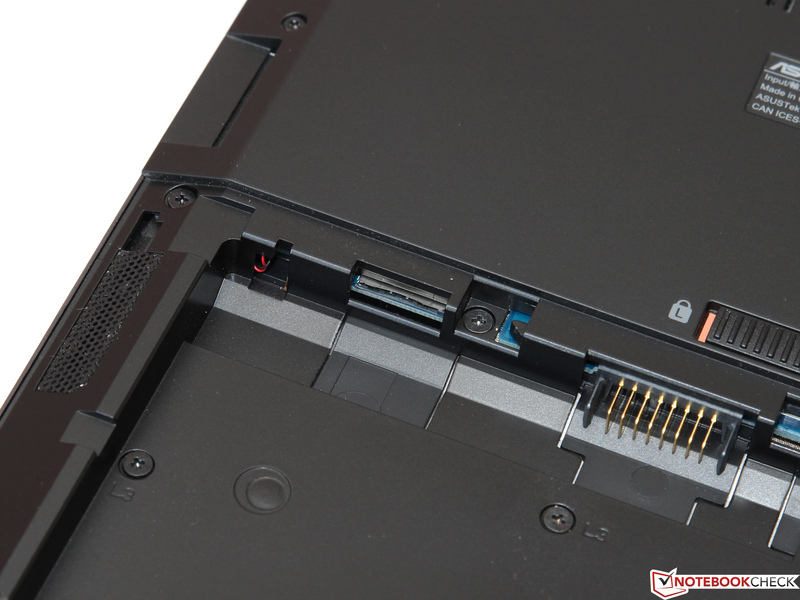 However, once again, we want to mention the significant price differences – the standard configurations of the EliteBook 820 G1 and ThinkPad X240, which we did not review, are equipped with slow HDDs as well. The user could experience a small delay in Windows startup or complex applications in particular, since the 4 GB memory will result in more swap file accesses. 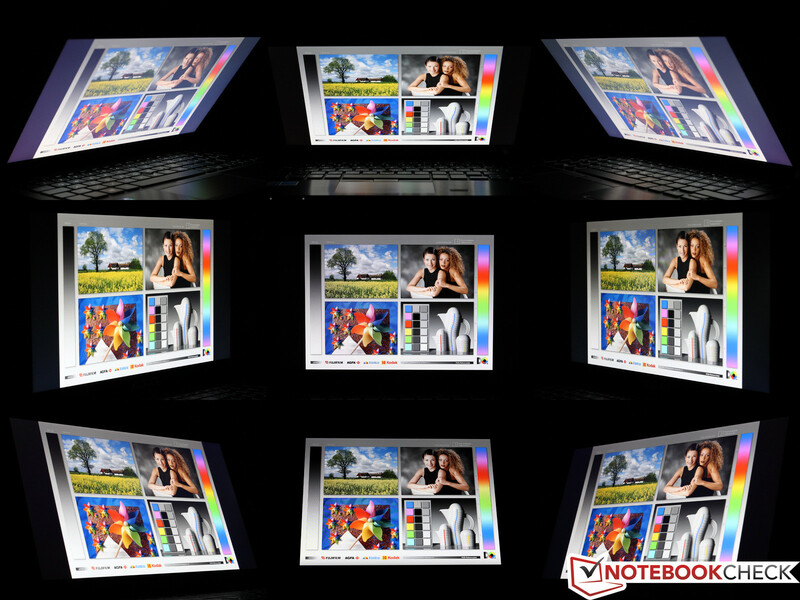 However, once the applications run, the notebook has no problems with all common office tasks and light multi-tasking. We would still recommend that you install an SSD as well as a memory upgrade to 8 GB to improve the system performance at a comparatively low cost. 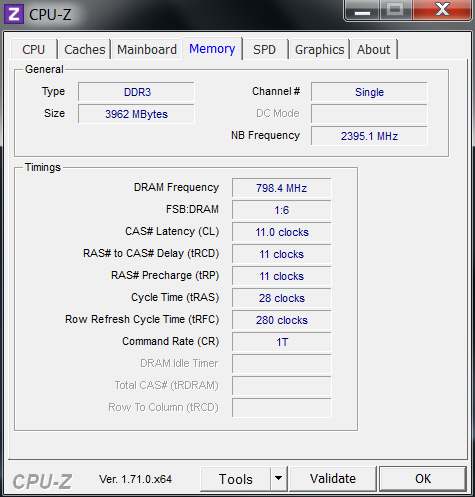 As mentioned before, integration of an additional DDR3 module would have another positive effect: The memory controller would then work in a dual-channel configuration, which would improve the 3D performance of the HD Graphics 4400 by around 10 to 30%. 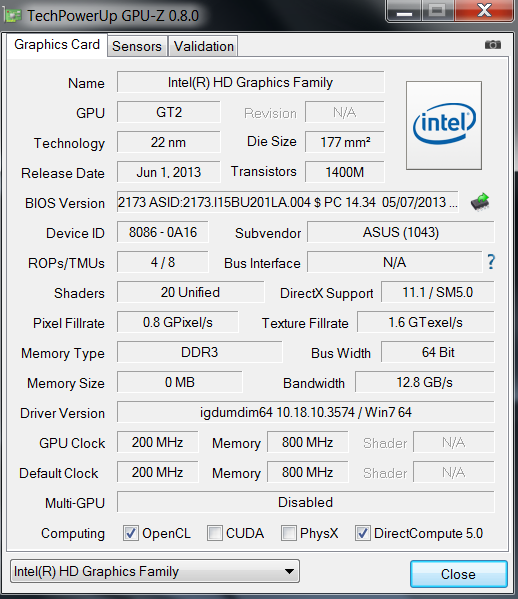 However, even then, the performance is relatively low: A dedicated mainstream solution like the GeForce 840M is roughly three times as fast, but the HD Graphics 5300 from the new Broadwell chips with a TDP of just 4.5 Watts is hardly slower. 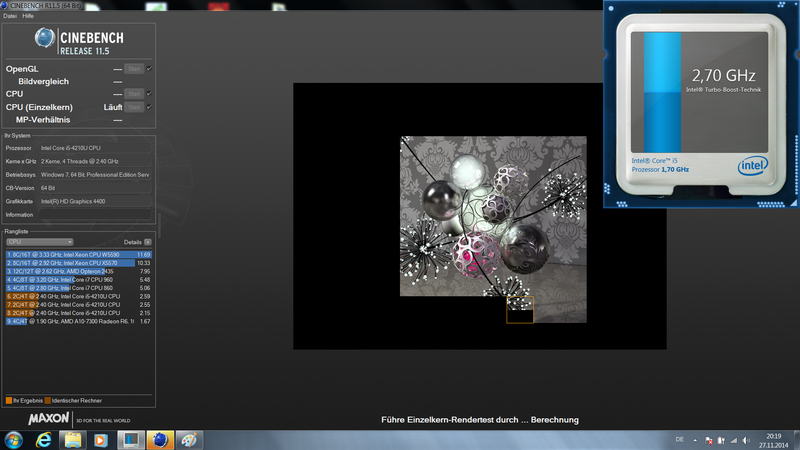 The multimedia talents of the HD 4400 are still perfectly competitive. H.264 trailers are played smoothly even with very high data rates of 100 Mbps and in 4K resolution without CPU usage increasing significantly. Furthermore, the GPU supports Intel's Quick Sync feature, that can transcode videos faster, and is more efficient than any (notebook) CPU. Even though we tested three pretty undemanding games from the last year – Dota 2, Bioshock Infinite and Tomb Raider – the HD4400 only managed smooth gameplay with (very) low settings. 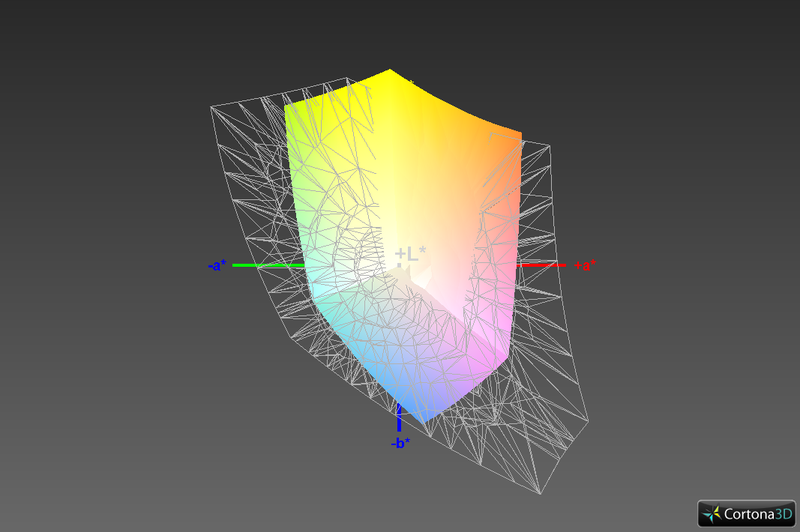 However, this should not be a huge issue for a business device, at least if you do not plan to use complex 3D software like CAD applications, for example. You can hardly hear the fan of the notebook when it is idling or just performing light office tasks. The fan is usually completely deactivated in these scenarios, so the slight murmur of the hard drive is the only noise. But the BU201 is also pretty restrained under load: We could not measure more than around 33 dB(A) even in extreme situations. Whether the ThinkPad, EliteBook or Latitude – none of the rivals is a quiet as our review unit, although the differences are not really big. That the cooling solution is not only very quiet when it dissipates the heat from the case, but also very efficient is apparent when you look at the case and hardware temperatures. 29 °C (~84 °F) is the average chassis temperature while idling, and just 5 °C (~41 °F) more under maximum load. The heat development is also concentrated in the rear area of the device, while the palm rest stays conveniently cool all the time. Inside, we can measure a core temperature for the Core i5-4210U of slightly more than 70 °C (~158 °F ) when we simulate an absolute worst-case scenario with Prime95 and FurMark. Considering the maximum operating temperature that was specified by Intel, which is exactly 100 °C (~212 °F), there is a generous headroom for the operation in the summer. But we can still determine throttling, which means a clock below the nominal frequency, that is caused by the TDP limit of 15 Watts. In this case, the GPU is prioritized over the processor, which results in a pretty high GPU (750 MHz) and pretty low CPU clock (1.1 GHz), respectively. (±) The average temperature for the upper side under maximal load is 32.9 °C / 91 F, compared to the average of 30.7 °C / 87 F for the devices in the class Subnotebook. (-) The average temperature of the palmrest area of similar devices was 28.6 °C / 83.5 F (-2.2 °C / -3.9 F). You should not expect too much from the speakers in an office notebook, which is once again confirmed by our review unit. The unpleasantly shrill, high tones are combined with pretty tinny medium tones, while the bass is almost completely missing – it is pretty hard to enjoy music and movies. Still, the speakers are adequate for everyday situations and they are sufficiently loud. 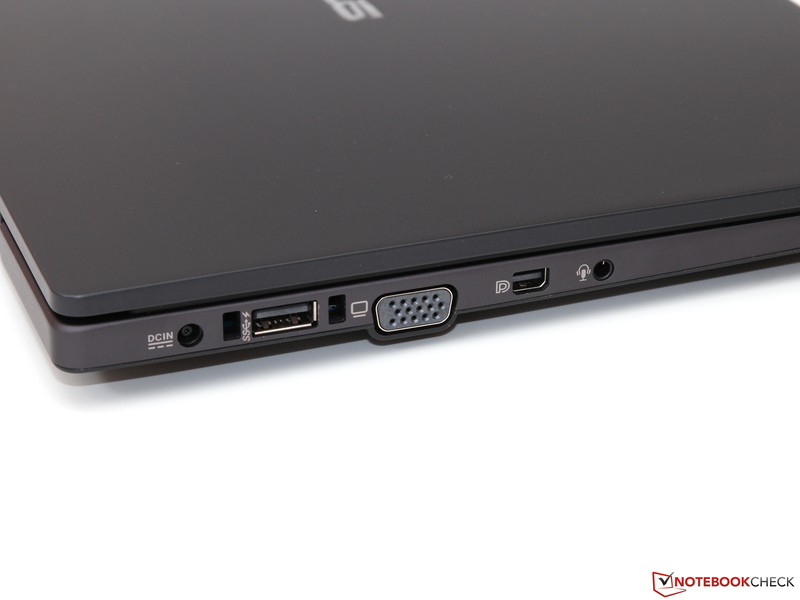 The idle consumption of 3.7 to 9.0 Watts is similar to the Full HD version of the ThinkPad X240 (3.9 to 9.8 Watts), whereas the EliteBook 820 G1 is even slightly more frugal (3.2 to 7.5 Watts) because of its darker WXGA panel. The conventional hard drive of the BU201 should consume slightly more power than the SSDs inside the rivals– one more reason to integrate a fast flash storage. 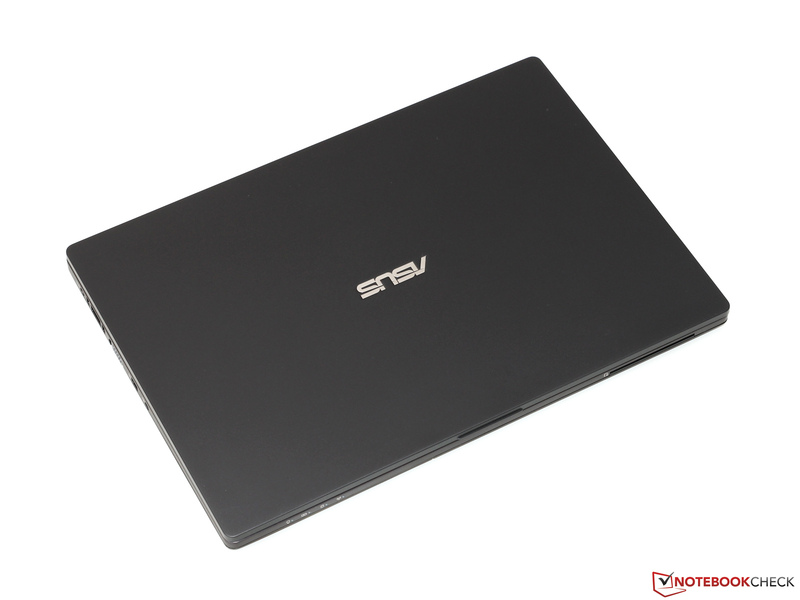 Our measurement device shows between 28.8 and 30.3 Watts under load, which are typical results for an ultrabook of this size. 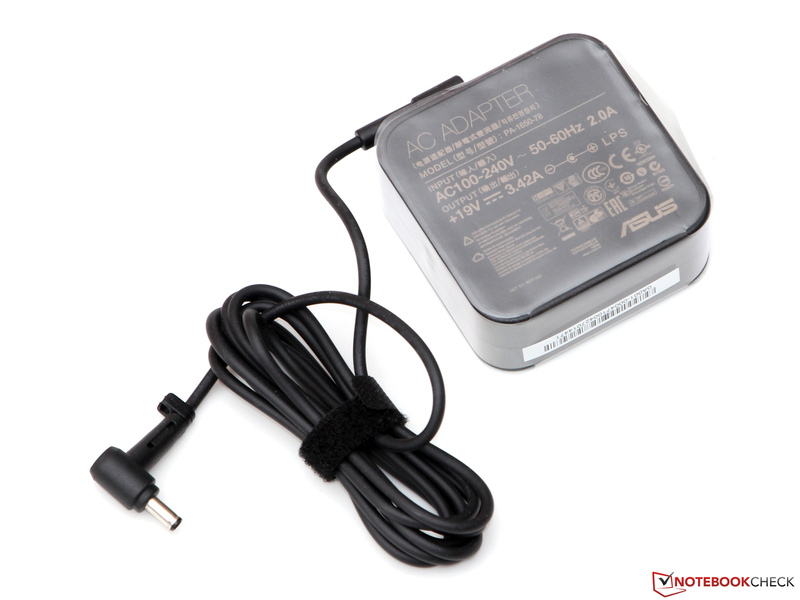 Asus still provides a powerful 65 Watts power adapter, despite the low power consumption, so the charging times of the battery in operation are not very long. Fortunately, the battery is not fixed inside the case, but can be easily replaced in one step at the bottom. Besides the fact that the notebook does wobble without the battery, we do not like the meager capacity: Just 32 Wh are definitely not sufficient for a mobile subnotebook. The Battery Eater Reader's test (energy-saving mode, minimum brightness, WLAN off) determines a runtime of 7 hours and 43 minutes for the BU201, which is much shorter than the results of the ThinkPad X240 (12 hours) or EliteBook 820 G1 (13.5 hours). Increasing the brightness to a more realistic value of 150 cd/m², and activating the WLAN connection, results in a runtime of just 3 hours and 38 minutes for web browsing. The battery is also sufficient for the playback of one or two movies. The minimum run time is determined by the Battery Eater Classic test (high-performance profile, maximum brightness, WLAN active) and the result is acceptable with 113 minutes. However, this value would probably be lower without the reduced clock on battery power. We almost have got used to the fact that high-quality business notebooks cost much more than 1,000 Euros (~$1230) – especially if you do not want to have a mediocre TN panel. 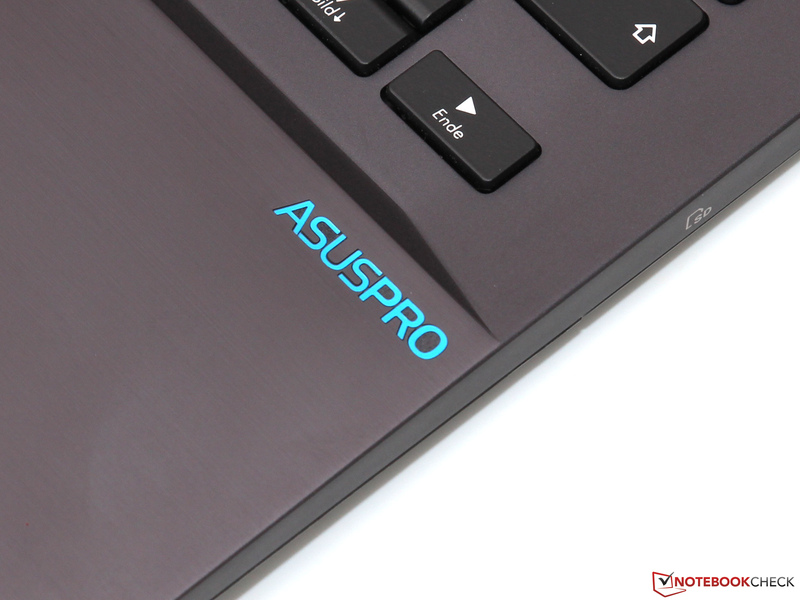 But the AsusPro Advanced BU201LA now proves that it does not have to be that expensive: For around 800 Euros (~$985) you get a really good professional device with decent features, impressive input devices and low emissions. 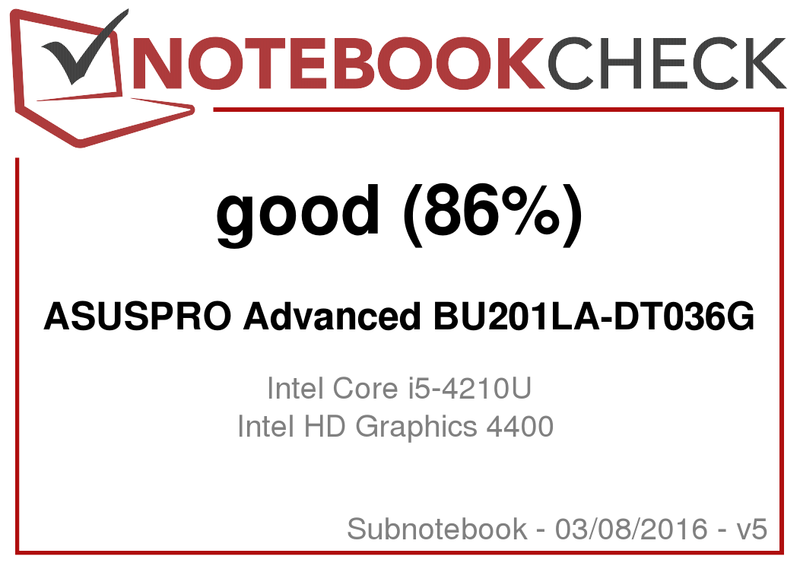 Once again we want to mention the great IPS display and the crisp keyboard at this point, which can easily compete with the highly praised ThinkPad counterpart. 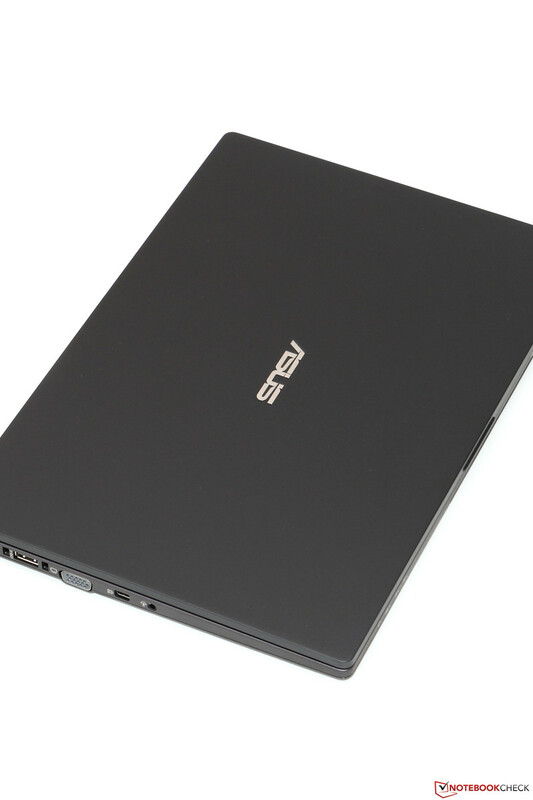 It is rather unfortunate that Asus equips a compact subnotebook with such a small battery. No more than 3 to 4 hours are unrealistic in everyday scenarios, especially since an optional additional battery is not available, either. 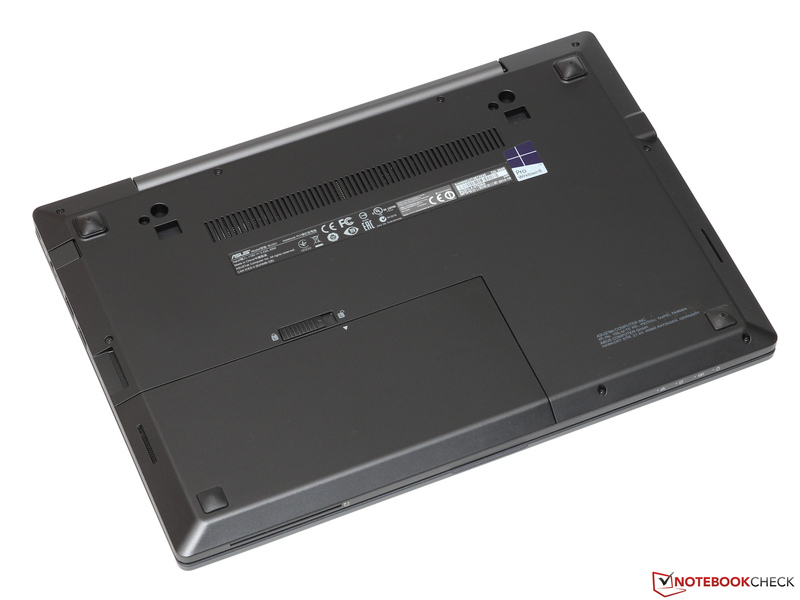 We would also like to see better maintainability similar to the HP EliteBook 820 G1, for example. 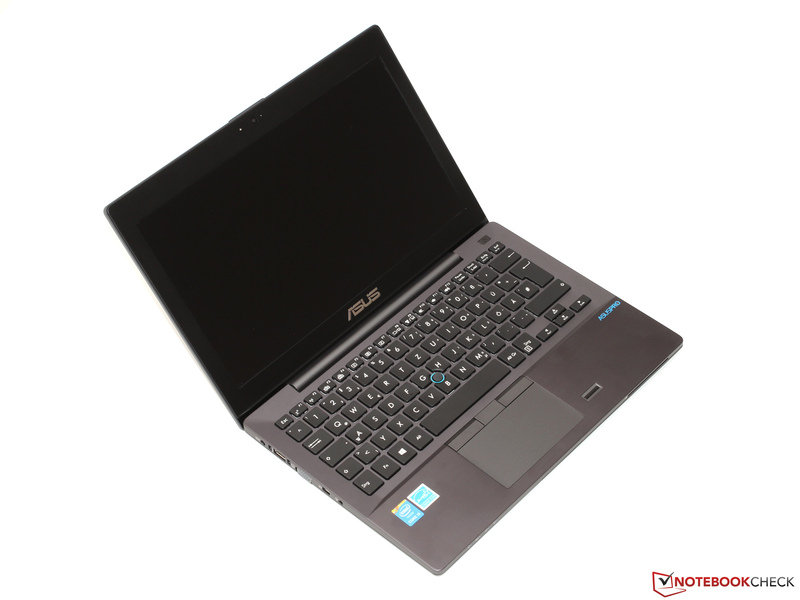 Still, Asus offers a successful overall package, and currently it is not easy to find another device with such a good price-performance ratio. This is also good news for the customers from HP, Lenovo or Dell since competition is never bad – more price pressure would not hurt the business segment. 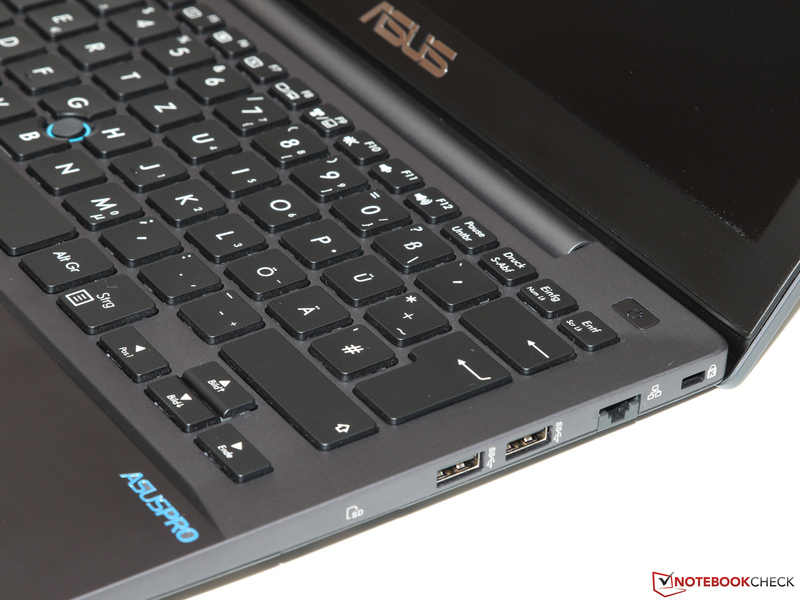 In Review: Asus ASUSPRO Advanced BU201LA-DT036G. Test model courtesy of Campuspoint. ... which is called AsusPro. ... and plastic surfaces that are easy to clean. ... only the quality of the lid could be a bit better. ... the device is very easy to transport. ... as well as 3x USB 3.0. 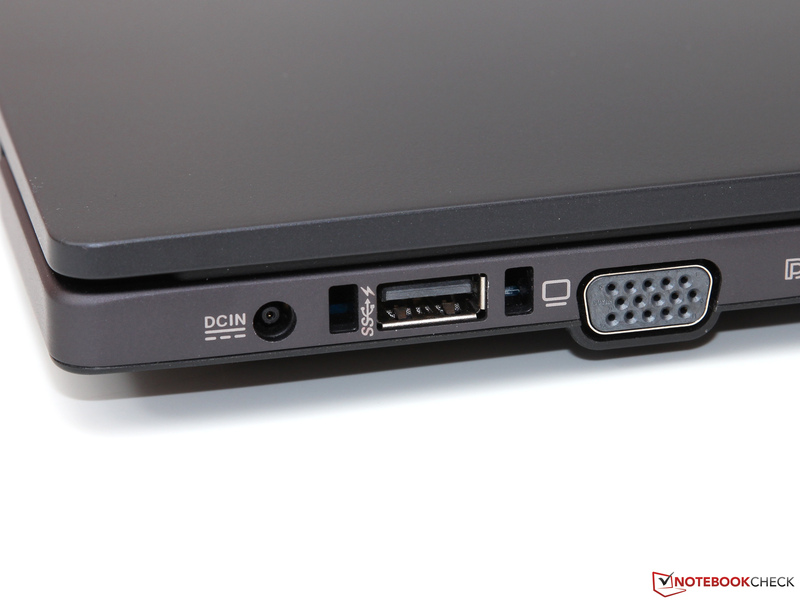 One of the USB ports is also a docking port. ... that can be folded out. Except for the card reader, all the ports are pretty easy to reach. The security features include a fingerprint scanner and SmartCard reader. ... which can be illuminated if necessary. 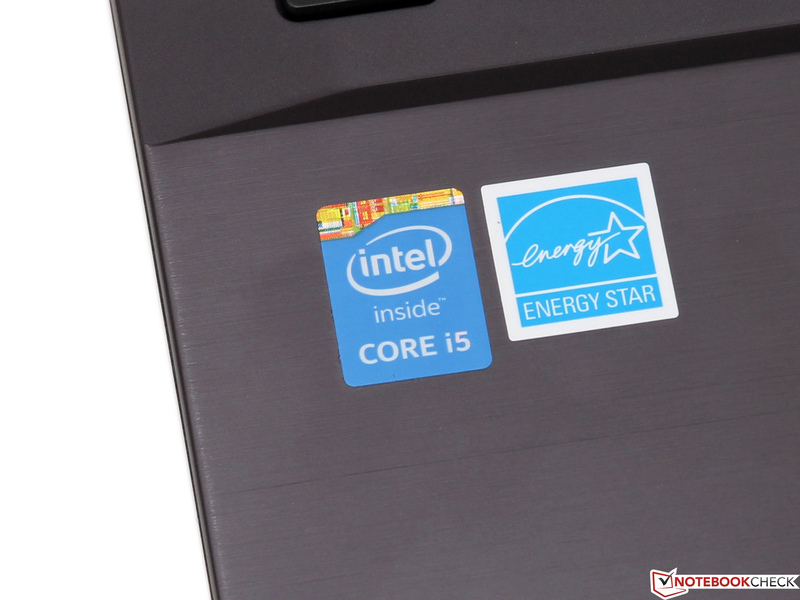 Heart of the notebook is a fast Core i5-4210U. ... only the battery can be replaced without problems. 32 Wh are unfortunately not sufficient for long battery runtimes. Underneath the battery is the SIM card slot, at least if the configuration has a 3G/4G modem. The manufacturer provides a 65 Watts power adaptor. Despite the comparatively low price, the AsusPro BU201LA can convince with its great keyboard, impeccable build quality and a bright IPS display. Besides the missing SSD it is mainly the pretty small battery that prevents a better rating. 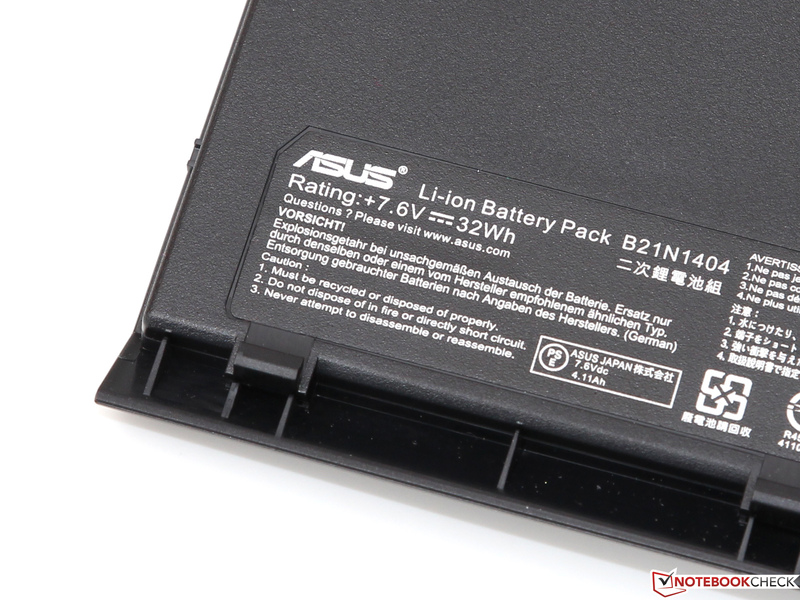 It is unfortunate that Asus does not even offer a bigger battery as an option. Even though the manufacturer explicitly highlights the carbon fiber reinforcement of the lid, this part of the notebook is actually pretty unstable.